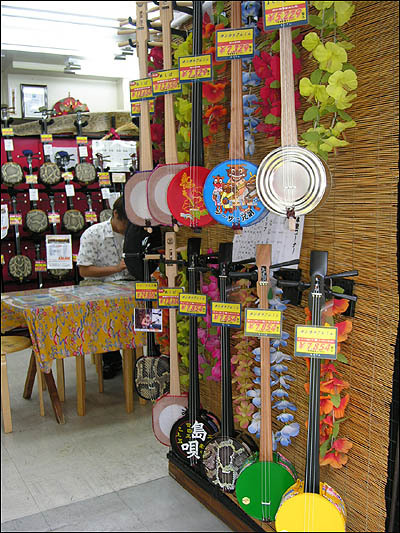 Apart from the odd sound of a U.S. army helicopter drifting through an open window, the air was full of the melodic clucking of the sanshin, an Okinawan three-stringed guitar. My wife and I were sitting in a roadside restaurant somewhere between the cities of Naha and Nago on the main island of Okinawa. 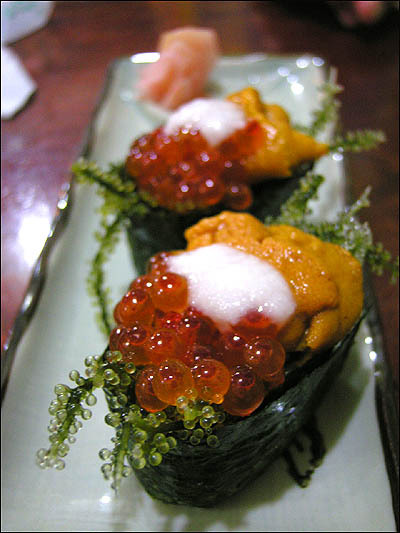 We had just ordered a dish of umi-budo-don, a specialty consisting of umi-budo, or sea-grapes, uni, sea urchin and ikura, red fish eggs. The walls, painted the day-glow colors of a neon sunset, gave off the cheesy vibe of a black velvet painting. We crossed our fingers and hoped the decor wasn't a reflection of the food. When the dish finally arrived all thoughts of tropical kitsch were soon forgotten. Our meal, culled from the indigo waters off the coast, was delicious. 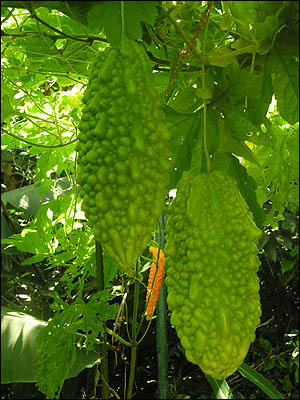 We may have come to Okinawa for the sun and diving, but we had also discovered other keys to longevity: raw fish guts and a green, bitter gourd called goya. 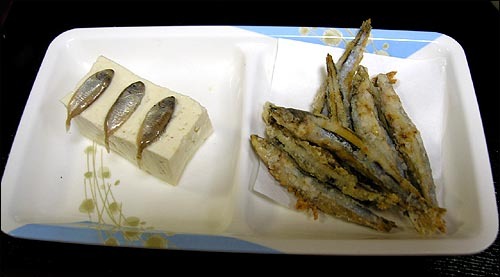 The Uchinanchu (local dialect for Okinawan people) have the longest life expectancy of anyone on the planet -- 86 for women and 78 for men -- and diet is one of the main contributing factors. Another factor is the Okinawan lifestyle. 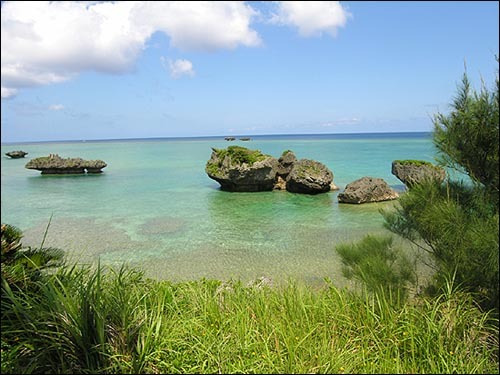 "Okinawa time," the islander's casual relationship to the clock, set the Uchinanchu far apart from mainland Japanese. Nan kuru naisa, (don't worry, be happy) is the local creed and clocks rarely agree with one another. 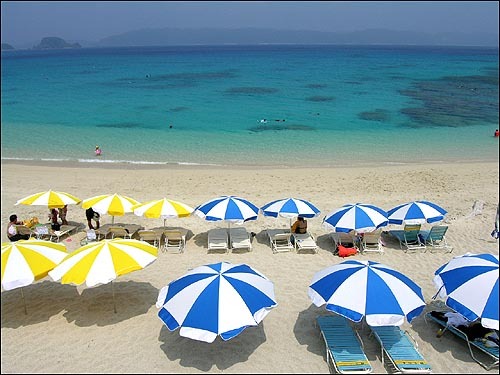 The Okinawan islands stretch over 1,000 kilometers from Kyushu (the largest southern island of Japan's four main islands) to Taiwan. 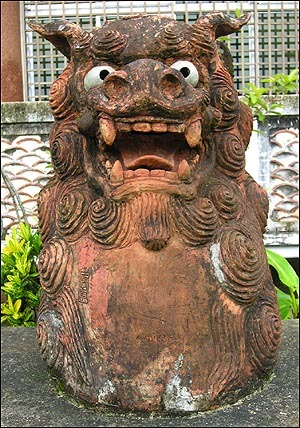 As a result, the Uchinanchu share more in common ethnically with the Taiwanese and Filipinos than with mainland Japanese. 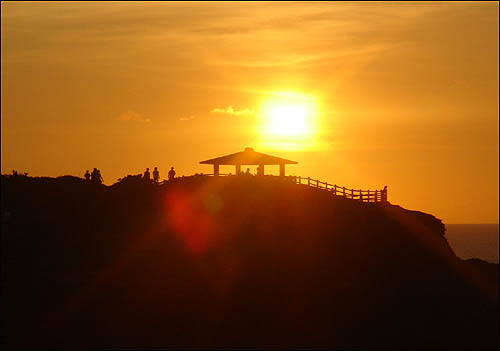 Once an independent nation known as the Ryukyu Kingdom, Japan officially renamed the islands Okinawa Prefecture following the Meiji restoration in 1879. During this period of rapid modernization, the Japanese forcefully took control of the Ryukyus and began assimilating the locals. Many Uchinanchu were forced to change their names to more common Japanese titles and give up their language and culture for those imported from Tokyo. 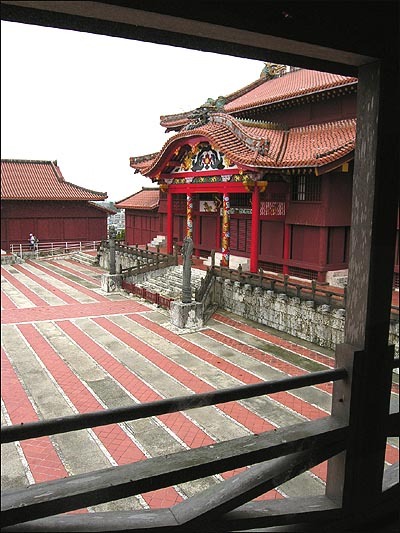 Shurijo, the royal castle of the Ryukyu Kingdom dating from the 13th and 14th centuries, was completely destroyed in 1945 during the Battle of Okinawa. Also known as the "typhoon of steel," it has since been rebuilt and is a source of local pride. A bell, remembered as a symbol of peace, once hung in the castle and bore the inscription, "Bankoku Shinryo," meaning, "Bridge Between Nations." On a drive around the southern tip of the main island, we came face to face with the turbulent history of the world's largest sea-land-air battle. At the Peace Memorial Park in Itoman City, stone blocks inscribed with the names of the over 200,000 individuals who lost their lives in the Battle of Okinawa are lined up like dominoes. Raging from April to June 1945, U.S. forces mounted a full assault to gain a foothold on Japanese territory while Japanese forces waged a defensive war of attrition. 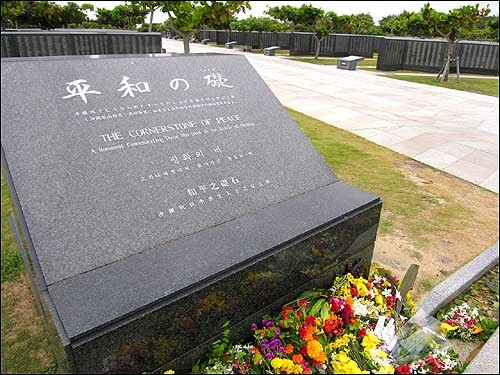 Much of Okinawa was mowed down to the ground as the islands were sacrificed by the Japanese to delay the Americans from attacking the main islands. This betrayal, as many Okinawans see it, wasn't surprising in light of the uneasy relationship that existed between Okinawa and the mainland. Nevertheless, following the war, while Okinawa was administered by the Americans, a reunification movement gained prominence. Finally, in 1972 the Ryukyus were returned to Japan. 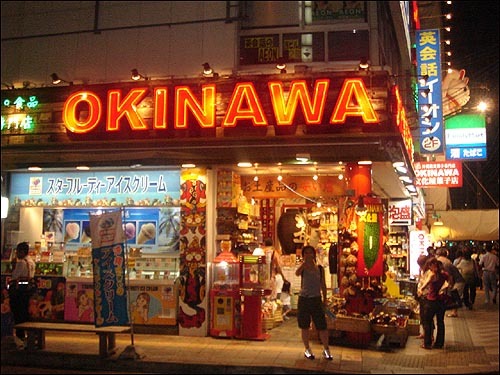 We soon discovered that the war is never far from anywhere in Okinawa. While we were scuba diving off of Zamami (population 600), a small island about 50 kilometers offshore from Naha, all signs of war seemed a million miles away. But to our surprise, an unexploded ordinance left over from the Battle of Okinawa was discovered close to the shore and officially detonated. For all the appearances of paradise, the war still remains literally just below the surface. While underwater, Miyazato-san, the owner of our hotel and diving buddy, grabbed hold of a porcupine puffer fish. We watched astonished as it flared up like a prickly volleyball in self defense and then swam away into the lucid blue distance of the warm ocean. After diving, we spent hours at the island's Furuzamami Beach snorkeling among schools of tropical fish and rich coral reefs. 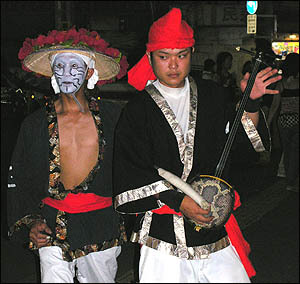 On our last night, while walking down Kokusai Dori (International Street) in Naha, a local troupe of Eisa performers (traditional Okinawan dancers) suddenly emerged from traffic. They pulled up in two small flat-bed trucks waving their taiko drums and began a free performance in the parking lot of a convenience store. Two chondara, or clowns, ran around exciting the audience while the entourage played on. After 20 minutes they packed up as quickly as they arrived and sped off. We were left wanting more, but time had finally caught up to us. We adjusted our watches and reluctantly prepared to return to a life full of more predictable punctuality and less spontaneous pleasure.